THE PRODIGY is a horror slasher/possession film that by nature of the script evokes a lot of thinking – at least from my part. Part of these will be mentioned in the review. 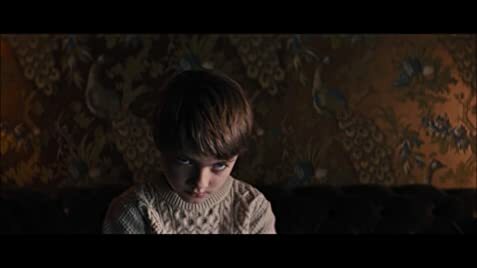 The plot centres around a child, Miles (Jackson Robert Scott) whose disturbing behaviour signals that an evil, possibly supernatural force possessed him, forcing his parents, Sarah (Taylor Schilling) and John (Peter Mooney) to investigate whether sinister forces are involved. Miles is a prodigy with exceptional learning ability though socially backward. The film is clear later on to let the audience know the difference between possession and reincarnation though the effect of both on a horror film is the same – i.e Miles behaves like a different being. The film begins with three intercut scenes. One is a woman screaming for help, running out of the woods stopping a car driven by another woman, who stops. The second is a birth, an early one at that, with the mother in labour. The scene is intercut with a man in his tool shed, called out by the police and then gunned down in the yard. The man clasps what seems to be a severed hand. When the woman gives birth the writhing baby fades into the dying man that was gunned down by the police. The film then moves on in years when the baby is now grown to a boy of different ages 8 and 10. It does not take a genius to fit the pieces of the jigsaw together, but it is still fun doing it. The dead serial killer is reincarnated in the boy. The parents have to figure out what is happening and who the reincarnating killer is and save the day, and hopefully their son in the process. A doctor, Arthur Jacobson (played by Canadian Colm Feore) aids in solving the mystery. The film is supposedly set in Pennsylvania but shot in Canada. The actors are a mix of Canadian and American casting. McCarty’s film is both scary in concept and execution. One is not knowing what your child will grow up to be. One scene has the mother wondering the same question, then assured by the physician that the boy is giftedly bright. The film contains graphic gore and violence – the most disturbing scene involving the boy hitting another with a huge wrench. Not to mention any details, there is one glitch in the story that I thought evaded the scriptwriter. But upon closer examination, the script allowed for that discrepancy if one thinks hard enough. The details will not disclosed for plot twists would have to be revealed. THE PRODIGY is not without its loose ends (how did the boy get the sharp shears in the car? How did the boy have the tools to make the camera to spy on his parents), which is forgivable in a low budget horror movie. Still this is one hell of a thinking horror film, and a satisfying one nevertheless.